Tête de Cuvée from Ployez-Jacquemart. Encépagement is 65% Chardonnay from 1er cru and grand cru vineyards in the Côte des Blancs and Montagne de Reims and 35% of mostly Pinot Noir from Mailly with a splash of Pinot Meunier from Ludes. Aged in French oak with no malolactic fermentation. Medium gold color. First impression is ‘big’ and a bit forced on the nose: spiced orchard fruit, herb, brazil nut and a touch of burnt caramel now to go with a leesy overlay. Concentrated and full textured on the palate: developed apricot and bitter citrus, gingerbread, hazelnut praline. Spare yet fine bead. Satisfying, persistent mousse. A nice, carrying acidity, salted like the sea. There is a touch of bitterness at the end that reminds me a bit of Scotch. 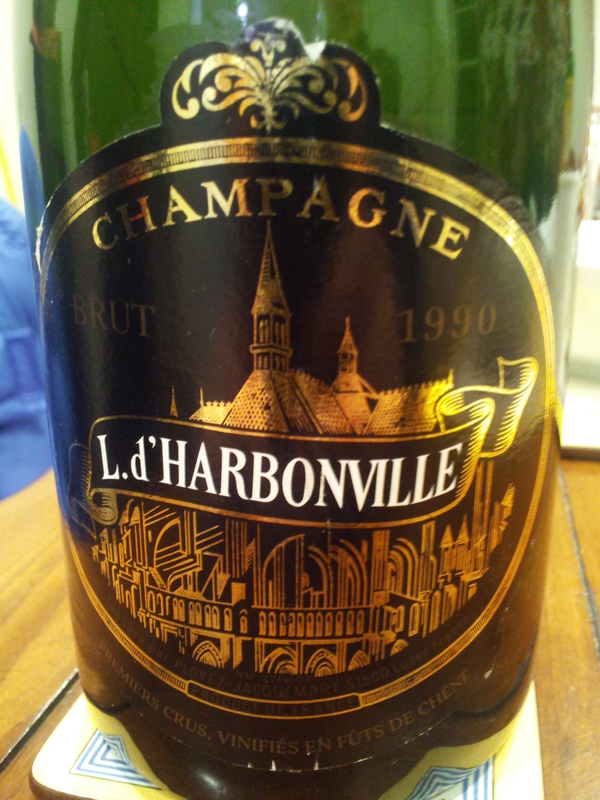 Warm, rich, bold and toasty: so both very “Liesse d’Harbonville” and ’90. Just a touch off the pace in refinement, finesse, depth and grace to rank among the very best from ’90. But it does get better mannered as it goes. That it finished better than it started goes a long way with us: perhaps a couple more years might civilize it yet. There is enough material here to consider this a fine bottle. Certainly worth exploring if your preferred style includes the oxygenation you get from barrique fermentation. Now – 2020+.